Indonesia has long been well-known as one of prominent furniture manufacturer country. The tropical country has a diverse variety of native woods with its unique characteristics, such as mahogany, albasia, teak, rosewood, and much more. One of the most favorable furniture collections from Indonesia is the modern outdoor furniture. As a tropical archipelago, the beach resorts are a valuable industrial sector. A lot of manufacturers and craftsmen produce high quality and exotic products for the modern outdoor line. 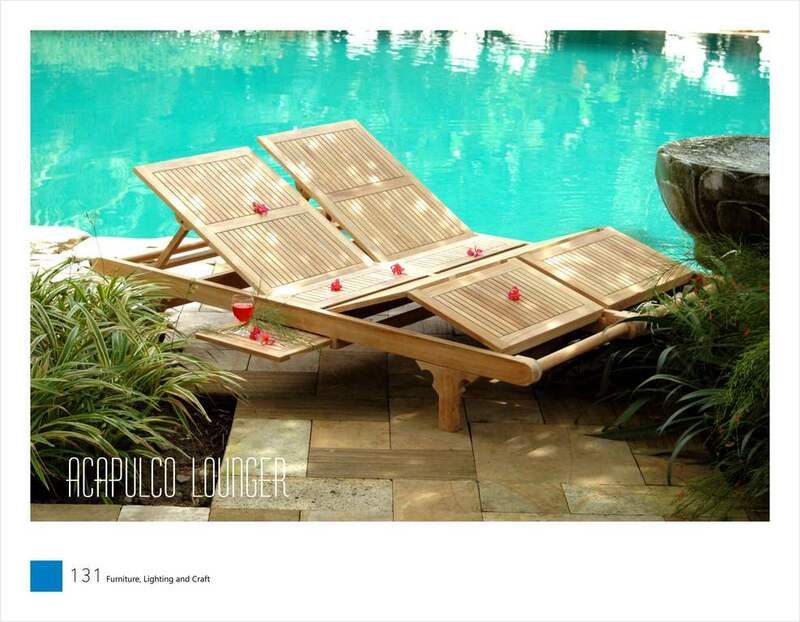 It is the reason that Indonesian’s modern outdoor furniture is always innovative, strong and beautiful. However, in choosing good outdoor furniture that is suitable with your need, there are several criteria that you should consider. They are the functionality, the durability, weather condition in your area and the aesthetic value. These criteria will help you determine the material that you will need to choose for your modern outdoor furniture. The functionality will closely relate on how you plan to use the furniture. Is it for your lovely patio or maybe for your tidy little beach house? Will you plan to rearrange them occasionally since you have quite outdoor space or they will sit nicely on the same spot until the season off? 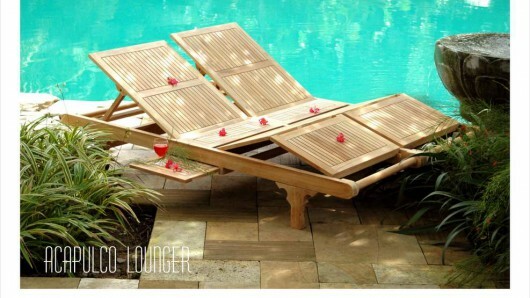 Solid teak wood outdoor furniture perhaps is the most expensive choice, but the price comes with great values. Teak is a hardwood, therefore it can be built very strong. It will not easily bend or bow as usually the other solid woods do. You do not have to worry about dent and scratch since the surface is pretty hard. It can handle extreme weather with no problem and also low maintenance. The wood can last up to 50 years with a proper maintenance and it can handle the cold and the rain very well. Solid teak also has an exotic grained finish that you can have only using a good top coat. However, as time goes by, the finish can turn into some grayish patina due to the natural oil that is produced by the wood. Actually, the oil is the one who keeps the wood from moisture and dry rot. Thus, if you want to preserve the original finish, an extensive maintenance will be needed. Having wooden furniture on your own patio, of course, will add exotic and tropical taste to your house. It is a very nice material for an elegant outdoor dining set, cushioned armchair and beach chair. The solid will have a nice weight against a strong wind, but you need extra effort to arrange and move the furniture set if needed. Stainless steel is actually the heaviest material that usually uses for modern outdoor furniture in Indonesia. It will be a very suitable choice for a beach house, hotels, and cottages in a windy and stormy coastline. It can also make nice and chic patio furniture if you want, but it will give a little trouble when you need to re-arrange due to its weight. The steel requires a good maintenance to last long. You will need to make sure it is properly coated to avoid rust. Once it got rust, it is almost impossible to get rid of it. In terms of design and aesthetic value, stainless still can give expensive and modern ambiance to the place. In Indonesia, it is quite often to combine the stainless still with synthetic rattan for more homey and traditional look. The result is a lovely and unique collection beautiful, strong, and shiny lines matched with intricate weaving. These pieces make a very nice hotel side pool dining table, beach lounge, cool modern minimalist patio set. However, it is quite pricey for home furniture; therefore if you want to invest stainless steel outdoor furniture, you should go for business purposes rather than personal use. Cast alloy furniture usually combines several metals material together. Mostly it is used aluminum as the predominant metal to create a durable, lightweight and low-cost material. This kind of outdoor furniture has a similar resemblance with stainless steel collection, but far cheaper and lighter. This material is used widely in making an outdoor chair in Indonesia since the weight makes them possible to be arranged easily. It is also strong enough for heavy duty occasion, but mostly they use it for an outdoor dining area in a restaurant or an indoor pool. The cast alloy material is also usually combined with a water resistant padded cushion, removable cushions, and synthetic rattans. It can give an adequately elegant look, though the luxury ambiance will be gone once you try to lift the piece. It is also not suitable for windy and stormy weather or as beach lounge sets. Nevertheless, the cast alloy is pretty much everybody choice for simple, nice, economical, and all-purposes modern outdoor furniture. Synthetic rattan made from resin that is molded into intricate rattan weaving pattern. This is one of the best outdoor furniture’s materials due to its exotic look and durability. It is very low maintenance since the material is water resistant like plastic. You do not have to worry about rust, though re-coating will be required if it exposed to sun rays for a long time. The original paint usually faded under an extreme blazing sun. The manufacturer usually put some extra weight on the base of the item or inside the wicker furniture. It will help them fight the strong wind and light storm at the coastline or beach houses. You can also pick the finish color to match your place since they come in wide variety of color. The natural finish will give traditional and resort ambiance to your outdoor patio, while the sleek black and warm brownish finish will create modern and chic looks to an outdoor lounge or a poolside.